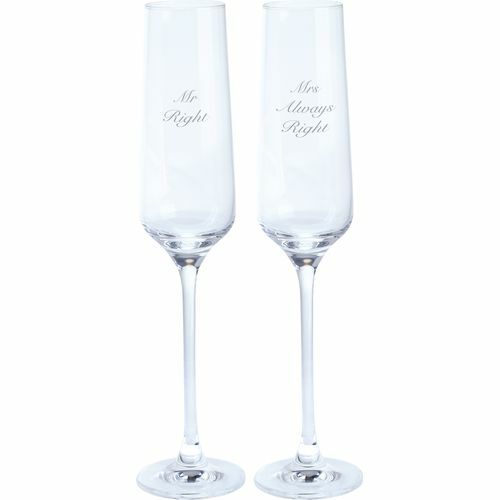 These Dartington Crystal Just For You Flute Pair feature a long, narrow bowl, decorated with the words Mr Right & Mrs Always Right. The clear, long stem gives you enough room to keep your hand away from the bowl, avoiding making your drink warm. Whatever the occasion Dartington Crystals Just for You range offers a selection of personalised gifts perfect to mark any special celebration or to show how much you care for someone special. Birthdays, weddings and anniversaries are all celebrated with these beautifully engraved crystal glasses. Each glass is supplied in an attractive gift box making them easy to give and a delight to receive.